Dinner is served…in under 20 minutes. It is common knowledge that fish, and especially salmon, is good for you. High protein, iodine and other ocean minerals, etc etc etc. But not all salmon is created equal. The wrong kind of salmon creates inflammation in the body because the nutrition rule that applies to us goes for all critters: you are what you eat. Wild-caught salmon is the only salmon worth your money. (My hero Mark Sisson gives a thoroughly documented explanation of why. Read it here!) I’m a stickler when it comes to making sure my protein sources are clean-sourced, not just because of the benefit to my health, but also because I care about this beautiful planet we call home–and it needs to be kept healthy too. I found these lovely wild-caught salmon fillets in the frozen foods section of my local grocery store. If you track the sales, you can find it for $4-$6 dollars a pound. So basically, you are going to enjoy a gourmet main dish for less than $1.50 per serving. You’re welcome. All you do is drizzle some olive oil on a baking dish, dry your salmon pieces with paper towels, and sprinkle them generously with turmeric. And while we’re on the subject of turmeric…this stuff is seriously amazing. You may have mostly seen it in curry dishes, but this friendly little root has tons of benefits: anti-inflammatory, antiseptic, yeast & parasite deterrent, anti-carcinogenic, pain reliever, and more… I try to sneak it into soup, smoothies, and everything I can. Including this salmon dish. So sprinkle it on generously…your body will thank you. 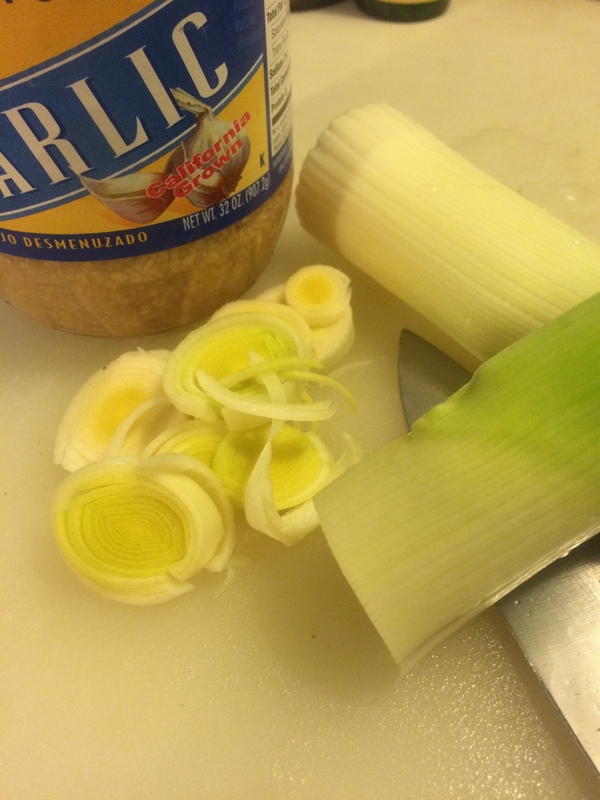 Next step is slicing up some leeks. A mandolin works for this, but I just try to slice as thinly as possible with my knife. 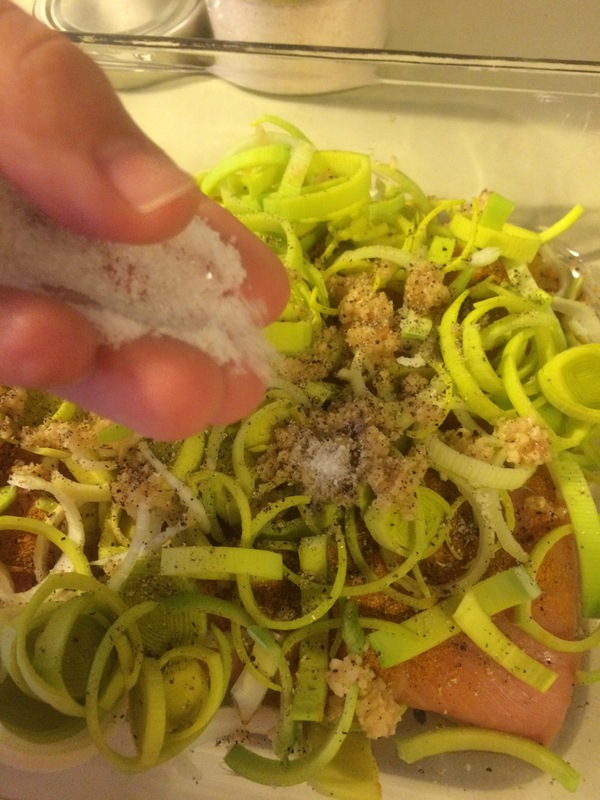 Cover your salmon with a nice fragrant layer of leeks, and sprinkle ample amounts of crushed garlic, fresh cracked pepper, and unrefined sea salt. 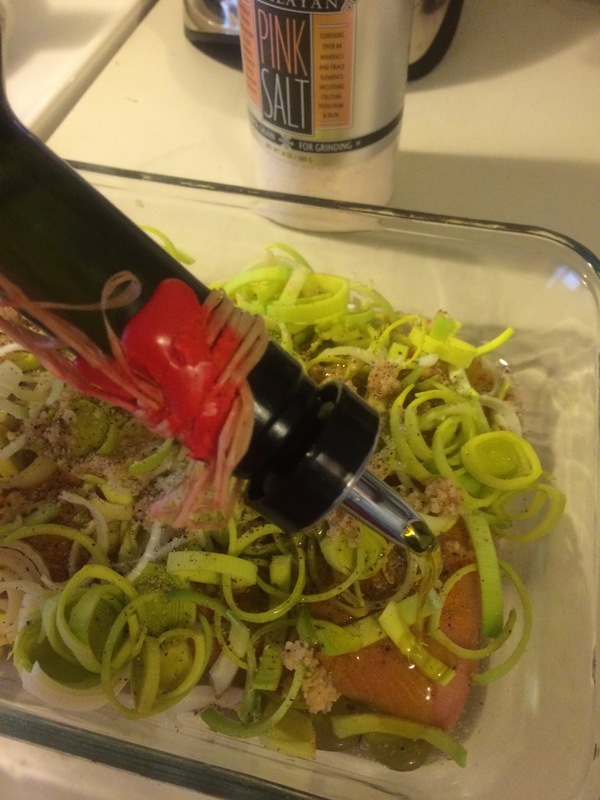 Then drizzle generously with more olive oil and pop in the oven. I like to serve this on a bed of crisp arugula with a drizzle of balsamic vinegar or a squeeze of lemon juice, but any veggie or starchy side will work. Bon Apetit! This recipe is all about sprinkling stuff. 2 tsp unrefined sea salt. Preheat oven to 375 deg. Lightly drizzle bottom of rectangular baking pan with olive oil. 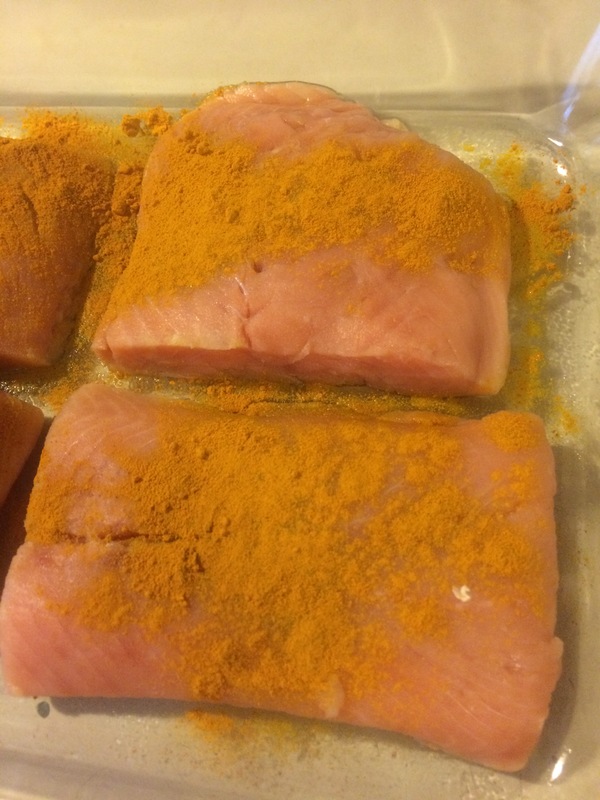 Pat salmon fillets dry with paper towels and arrange in pan. Sprinkle evenly with turmeric powder. 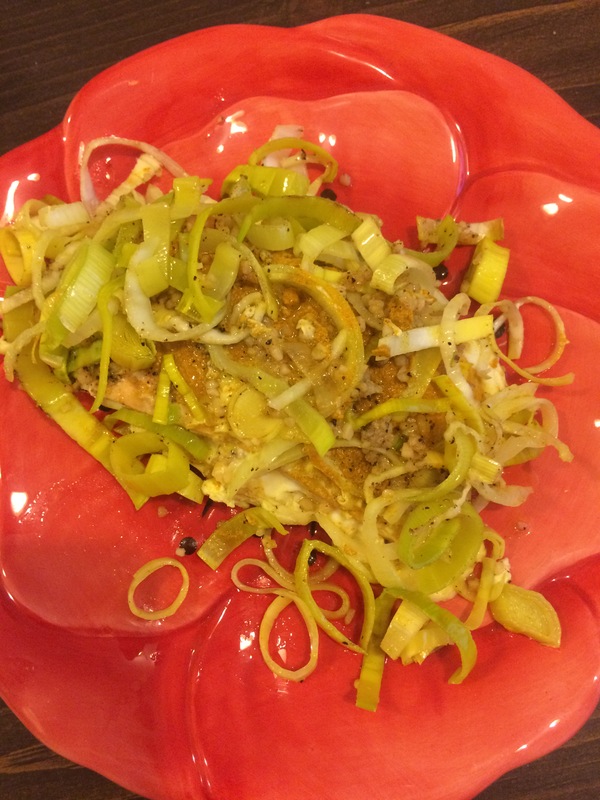 Thinly slice leeks and arrange over salmon. Sprinkle crushed garlic over this. Drizzle the whole thing generously with olive oil. Bake at 375 for 5 minutes, then turn down heat to 325 and bake for another 7-10 minutes, until salmon flakes easily with fork. Do not be shy with the olive oil! Omg! Love this blog!!! Can’t wait to try this salmon. I’ve been trying to eat clean and more raw foods. Looking forward to more posts!